Help! Confused? There's some help below, simply click the item on the list you need help with, if we can be of any further assistance, please don't hesitate to contact us. The image viewer is really simple to use, and is designed to give you a full look at our vehicles, sometimes there may be additional media available too, like 360 degree views or movies, look to see if the title says "Media Available". If you can't see the viewer at all then you need to download the latest version of Flash from here, it's free and completely safe! 1) The play controls - Let you pause or play the slideshow automatically, and the little arrows let you move forwards and backwards through the available images. 2) The back arrow - Loads the previous batch of images into the preview bar. 3) The preview bar - Click on an image here to load it into the viewer window, this will automatically pause the slideshow to let you study your selected image. Simply use the play button (1) to start it again if you like. 4) The forward arrow - Loads the next batch of images into the preview bar. Simply hit the button marked "Print this car's details" and your computer should open the print window to let you select the option for your printer. It should be as simple as selecting "OK" from that window! If you are having difficulty it could be due to a variety of factors including your browser setup, we recommend using Firefox (available free here) for the most predictable results. If you continue to experience difficulties please email us directly and we will help you, or send you a print ready pdf file. 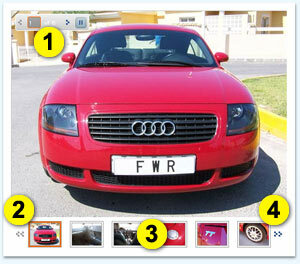 If you want to store or email someone else pictures of a vehicle then please hit the "Download Photos" button. This will open a link to let you download all the photos presented in the viewer as a zip file. Once you have downloaded the zip file (typically it is only about 400-500k) you need to "unzip" it to extract the photos. All major operating systems (Windows XP, Vista, Mac OSX) have built in "unzipping" functions. Or you could use the commercially available product "WinZip" or any of the numerous free products available here. If you want a really good look at a vehicle we offer our "Request big pictures" feature. This button will open a new email message, with the subject already filled out. Simply hit "send", or perhaps enter any other queries you might have and we can assist you directly. 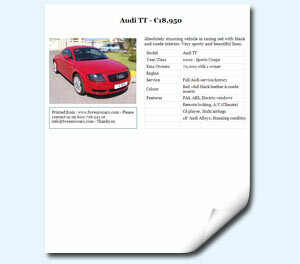 We will then reply as soon as possible attaching pictures of the car 800 pixels wide. If you require a higher resolution then please indicate your requirements in the email message. NB: Printers and advertisers - Please contact our designer directly: tom@mayersdesign.com and he can assist you with print resolution imagery. The Google map is easy to use, just click and drag in the window to move around, or use the other controls to zoom in and out (your mouse wheel works too) or swith from map views to satellite views. More help can be found here.